Product #17464 | SKU VCTFSA5 | 0.0 (no ratings yet) Thanks for your rating! The Sony VCT-FSA5 Shoulder Mount Accessory for PMW-F5/PMW-F55 is specifically built to allow you to comfortably hand hold the F5/F55 camera for documentary style shooting. The shoulder mount features a low profile to maintain a low centre of gravity and a sliding balance mechanism for adjusting the camera's balance front to back. 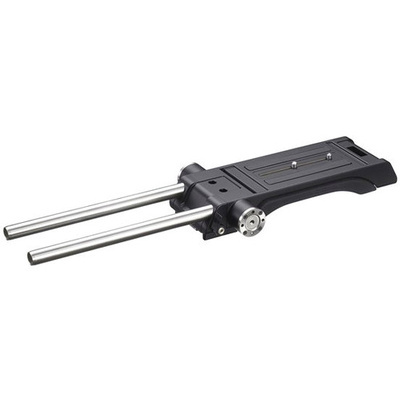 It includes two stainless steel 15mm support rods, and two 1/4"-20 camera tie down screws. The mount integrates a rubberised foam cushion for comfort, and two Arri compatible mounting rosettes for accessories. It is made from cast aluminium and features the necessary front wedge and back plate to fasten it to an available VCT-14 quick release plate. This allows you to go from tripod to hand held mode and back to tripod mode quickly, easily, and without having to adjust the shoulder pad.